PANOMAX Brixen im Thale - A splendid panorama view. Westendorf: PANOMAX SkiWelt Westendorf, 1.1 mi. Scheffau am Wilden Kaiser: Jochstub'n-See, 2.2 mi. Söll: PANOMAX Hexenwasser Wilder Kaiser, 2.3 mi. Hopfgarten im Brixental: B170, Brixentalstraße, 2.5 mi. 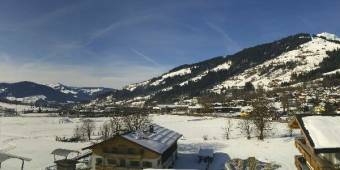 This webcam Brixen im Thale with the theme Landscapes was added on February 1, 2019 and is operated by PANOMAX. It got 60 visitors since then. Shouldn't this webcam work or should the link be wrong please report that here. You can add this webcam here to myCams.